There was no time for a lie-in for Lizzi as we headed out just after 9.30 a.m. for Jabal Shams in accordance with Mrs M's intensive programme. 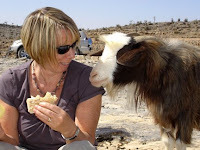 Lunch was taken on the rim of the canyon with a herd of goats which caught the scent of chicken and camembert sandwiches. One ram will have difficulty explaining his oniony breath to his mates after finishing a pot of leftover Swedish herring salad. 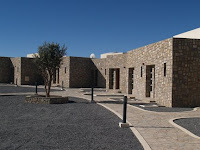 We checked in at the Jabal Shams Travel and Tourist Centre which has undergone a few improvements. There are fifteen new huts and a (goat proof) restaurant. The new rooms have been built to a high standard including TV and built-in ceiling speakers, whispering air conditioning units and smooth patio doors overlooking the distant mountains. There is, of course, a price to pay for these enhancements: 30 OMR per person with dinner and breakfast. With sensible sho es we drove to the start of the gallery walk (W6) from the ramshackle village of Al Khityam. Conditions were superb as we plodded along the path reassured by the gentle tap-tap of Mrs M's walking poles. A few hours later with the light fading, we returned to the car and received minimal hassle from the village children and the chap selling stones had been replaced by a goat in a tree. In the hotel’s restaurant that evening, we noted that the quality of the food had also improved as we unconsciously gathered all of the dishes at our end of the table beyond the reach of a few German tourists. Under twinkly stars, we ignited a large branch over a stack of dry brushwood to accompany a few Westolls (1 Westoll = 1/2 tumbler of late vintage port).